Acrobats, trapeze artists, jugglers, a contortionist, an equilibrist, Liberty horses and former shelter dogs are also on the bill. 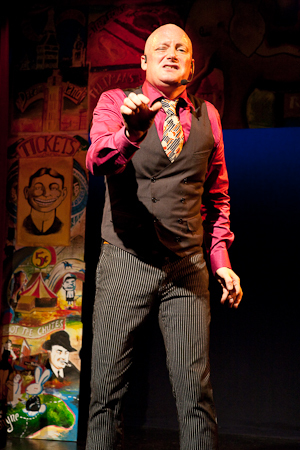 The jovial ringmaster John Kennedy Kane shares entertaining anecdotes about circus history relating to the Brooklyn Bridge and Broadway. 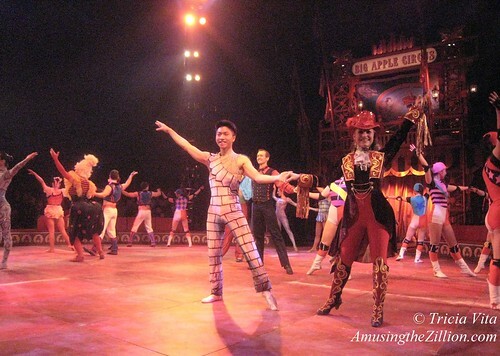 We learn that the first-ever circus ring measured 42 feet in diameter, which is the size needed for a horse to reach a full gallop, and that is precisely the size of the Big Apple’s ring. Over the years, Katja Schumann’s Liberty horses and Barry Lubin aka Grandma the Clown have been among our favorite performers. Lubin retired after last year’s show and we miss him. 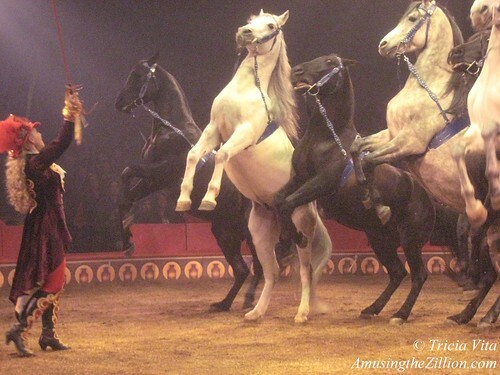 The highlight of the show was Jenny Vidbel’s Liberty horse act featuring Arabian horses and ponies. 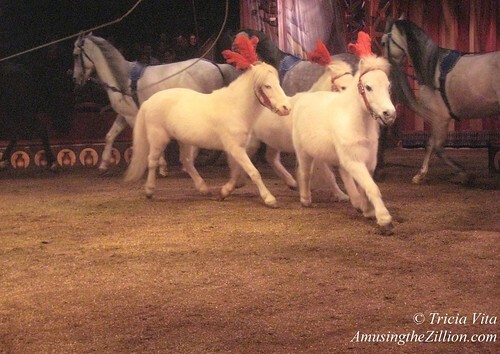 When the ponies trotted out, the audience let out a collective gasp of delight. Other standout acts were slack wire maestro Zhang Fan, Daniel Cyr and his mesmerizing Cyr Wheel, the Dalian Bicycle Troupe, Desire of Flight aerialists Malvina and Valeriy, and Emily and Menno van Dyke, who passionately dance the tango at the same time that they juggle. 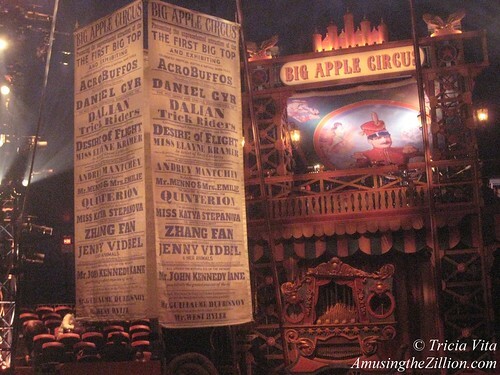 The Big Apple Circus, Lincoln Center, New York City, through January 13, 2013; Alpharetta, GA, February 1-18; Bridgewater, NJ, February 18-March 17; Boston, MA, March 26- May 12. If you missed Zero Boy‘s electrifying one-man show at Coney Island USA in October, we highly recommend that you get yourself over to the Gershwin Hotel tonight at 8 pm to see and hear “A Trip to Coney Island with Uncle Zero Boy.” The audience is the nephew. Read the full Q & A and watch a video clip of the show here. Here’s a trip you won’t want to miss! On Friday, October 16, Coney Island USA’s Burlesque at the Beach presents “A Trip to Coney Island with Uncle Zero Boy” by East Village performance artist and virtuoso “vocal acrobat” Zero Boy. As a longtime fan, we’re confident Zero Boy is the man to make the glorious hurly burly of Coney’s history come alive onstage. In a recent phone conversation with ATZ, Zero Boy talks about developing the play from a three-minute bit to a 45-minute work-in-progress, the inspiration for the set design, fave things to do in Coney, and oh yeah, how he got the name Zero Boy. For the record, his answers were punctuated with lots of laughter and little onomatopoeic flourishes. Photos of Zero Boy used with permission of the photographer Scott A Ettin. Q: When I first saw the notice for your show on the CIUSA website I was excited because of course I know your work and I love Coney Island. I thought, I have to see this! 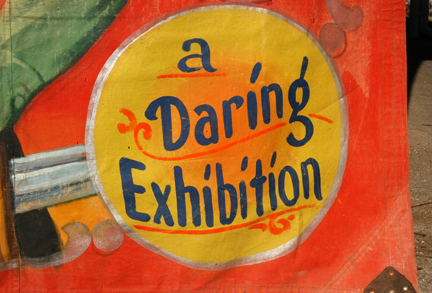 What will the show be like in relation to the history of Coney Island? A: Well, I do a comic romp through the past, present, and future of Coney Island. It’s sort of like a cartoon of certain big historical elements starting with the beginning of Coney Island all the way up to the 80s, 90s, to now. I did a thing called Stump Zero Boy where people would write in a two word scenario on the radio. I do a similar thing toward the end of the show. People say the Future of Coney Island is dot dot dot. Then I present the future of Coney Island via the audience’s suggestions. Q: How did you get the idea to do a show about Coney Island? A: It started as a routine last year I did in a show called “Astroland” at the Kitchen. They asked me to do a bit for it, three minutes of Coney Island Zero Boy style. That routine went from three minutes and developed into a 25, 30 minute routine. I knew I wanted to do a full blown play because the response to it in traveling around the country. When I was doing the routine in Seattle, Eugene, San Francisco, Albuquerque, Santa Fe, and in New York, it was sort of like a sail boat. I didn’t have to put up the sail very hard before the thing was flying across the lake. Every show, there’s a guarantee someone will come up and tell me, I went to Coney Island when I was bla bla years old. I saw Steeplechase. Or, oh I was too young to see it but… Or I went with da da da da. People come up and tell their stories. As I found out the history of Coney Island, I was really blown away. I developed the show and brought in a director from Seattle who really helped format the show for September 11 at Ars Nova. A: I read Charlie Denson’s book Coney Island Lost & Found, which I loved. It was a major inspiration for me and for the set design, along with the other materials we had. I did a lot of Internet surfing. This summer was the summer that I’ve gone to Coney Island the most. And I jumped on my bike and I rode around the whole island, which was a real interesting eye opener because most people just get off at Brighton Beach or the amusement district and that’s it. Seriously, people get off the train they just head for the beach. They never really go in the opposite direction. On Labor Day Weekend we were wandering around Coney Island. When you get there at 11 o’clock on a Sunday no one is there, you get there at 12 the place is hopping. Then we came around the corner— and I’d read that article about the Bell in the newspaper how the divers pulled the Bell out of the water— and here we are and they’re pulling the Bell out of the Coney Island History Project and I was the second person to ring the Bell that day! For me it was a special moment, I felt like it was Coney Island saying go, Zero Boy go, tell our story. I tell everyone this story. One, I tell people you should check out the Bell, and two, it really meant something to me, like history is coming back around. Because people really don’t know anything about Coney Island unless they really research it. I didn’t know anything. You realize the whole island was a giant resort that slowly melted away. I hope folks from Coney show up and say, oh you’re wrong about this, you need to add that, because the show really needs about 20 minutes more worth of material in my estimation. Q: How long is it now? Q: I saw that YouTube clip from San Francisco and I realized that it was probably a shorter, earlier version because it didn’t say anything about Luna Park or Dreamland. I love the intro Dr Hal gives you, he’s hilarious! A: At that Dr Hal show this guy David Capurro the Yo-Yo King was on the fly. No matter what performer is going on he throws up images off the Internet. He was on the fly doing that and I started interacting with it. It inspired me. The rest of the show, whole sections of it, I had gone out and done solo bits. So there were elements that had been tried and true with the audience. Now it’s a play rather than just a routine. I’m going to start adding interactive stuff where I’ll be using old film footage and literally as people turn and look maybe speaking to them sort of Zelig style. Q: Do you use props too? Q: Personally what are some of your favorite things to do in Coney Island? Q: What’s your favorite ride or game? A: My favorite would be the Cyclone, It scares me every time but I love it every time. The Cyclone is such a great old thing. Q: The Cyclone is in the show, right? A: Oh, of course, it’s the height of the show. It’s funny, if I had my druthers, my favorite ride would be the Steeplechase. If I could go back in time and ride that thing, that would be one of my wishes of life. Part of the show is based on my friend, a Lower East Sider who grew up on 13th Street between 2nd and 3rd. He told me about going to Coney Island as a kid in the 1940s and riding the Steeplechase horse and thinking he was gonna fall off. Part of my show is Uncle Zero Boy talks about when your grandfather grew up on the Lower East Side and he loved to go to Coney Island and I tell his story of Steeplechase and Luna Park. I talk about Dreamland, Luna Park and Steeplechase Park in one element of the show. You’ll get the reference to the Bell. Q: Oh, the Bell is in the show? A: Very briefly. I talk about the fire. I talk about everything went up in flames, and you hear bong bong splosh. I talk about the historical recreations they did. I talk about the Wonder Wheel… the Wonder Wheel, the largest ferris wheel in the world. It’s 600 meters in diameter. I bring out Frankie Yale. I bring out Al Capone. I talk about the Fearless Frogman himself. I basically cover a lot of bases in a small show. It’s such a huge, huge thing, but there are a few more bases I need to cover. That’s why I’m taking a long process and developing the show. I have this really great feeling about this Coney Island show. I’ve hit some universal vein. It’s the right time and the place is really wonderful. 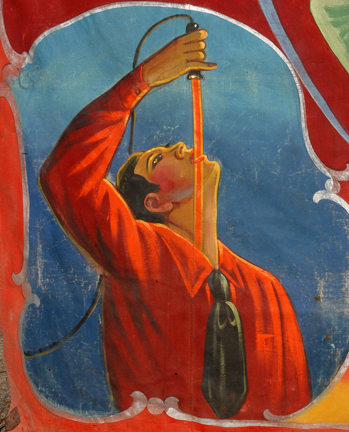 Coney Island was the template for so many things. 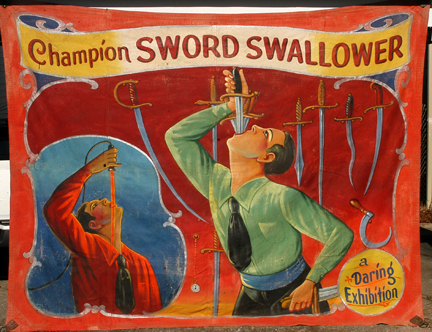 Id like to ultimately do the Fringe Festivals this coming spring and summer and fall. What would be cool is doing it in Times Square in a small theatre so people who are coming to visit New York get a little taste of this and go running out to Coney Island. Q: How did you become Zero Boy? I thought, gee I wonder if he did this as a boy at school? A: No this is what happened… when people interview me on the radio, how did you get the name Zero Boy, I say when I was a young kid I was hit by a radioactive mathematician and it gave me the superhero powers to make sound into reality, cartoon sounds. And then we moved to France and while we were in France, I was walking along the Champs d’Elysee and I heard non non non, which in English means no. And I look up and the Eiffel Tower is shaking and bolts are popping out. So I fly over and I turn on my welding finger. I hear “the hero boy the hero boy he saved us he saved the Eiffel Tower, the hero boy!” and I get the medal from the President. But the newspapers in America messed up and got it as Zero Boy. So I kept it.